“In an era of colossuses, he falls in love with a green leaf, a little star, the wing of a butterfly; and since the heavens and all eternity are reflected therein, he paints them as well.” Comments Hugo Ball, German author and founder of the Zurich Dada movement in 1916, on Paul Klee’s art. When Klee (1879–1940) finally settled on calling himself a painter, he brought to it all the wisdom and thoughtful reflection he had been pondering for years, stirring up a palette of ideas to go along with his palette of colors. 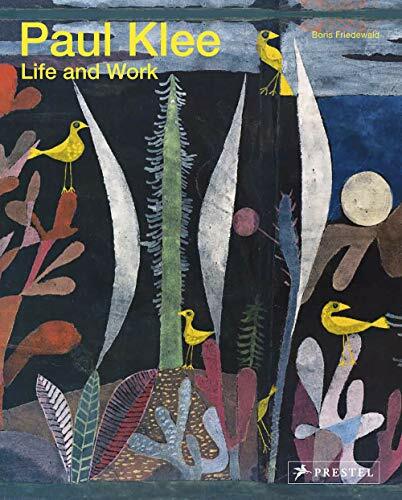 In Paul Klee: Life and Work, Friedewald expounds on the highs and lows, starts and fits, that made up Klee’s creative life and the personal philosophical road blocks that prevented Klee from spreading his professional wings. Not only is there the typical biographical chronology associated with artistic monographs, but there is a little deeper discussion developing side by side as Klee matures. Paul Klee did not trust he could paint without having first established his own “character and . . . positive worldview.” In other words, he needed to know who he was before he could present himself to others. Once Klee did grow into his own voice, he was overjoyed, and the art world shifted because of his conviction to be true to who he was in everything he created. Klee’s popularity spread steadily, his work sold throughout Europe and later in the United States. When his name fell on the ears of Walter Gropius, Klee found himself with a new forum for sharing his theories. He became an instructor at the Weimar Bauhaus. If those words are not temping enough, the fact that Klee died of natural causes, calmly, peacefully and was able to navigate the art profession with poise and savvy should be the ultimate motivation to pick up this book and be inspired by his life. Klee is recognized as being integral to the direction of Modern Art. Where he was inspired by Cézanne, Manet, van Gogh, and Matisse, contemporary artists toss a nod in Klee’s direction embodying many of his ideas into their work. Paul Klee: Life and Work gathers together the full spectrum of Klee’s frame of mind, revealing his character through his artistic personality. Friedewald makes it easy to latch on to Klee, mingle with his work, and take something away with for future contemplation.